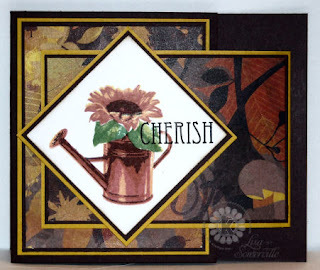 Designs by Lisa Somerville: Bloggers Challenge - Kitchen Sink Stamps Anniversary and more! Bloggers Challenge - Kitchen Sink Stamps Anniversary and more! Happy Friday, I'm so glad you stopped by today. I've got a lot to share with you, so grab your coffee and stay awhile, as I've done quite a bit of multi tasking today. 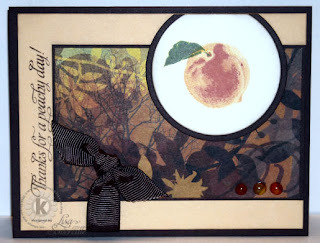 My posting is all about Fall, using the Bloggers Challenge theme Designer Paper, and also celebrates Kitchen Sink Stamps 2nd Anniversary! If you've never tried Kitchen Sink Stamps, there's a new product in the Kitchen - a new Mini Set - A Taste of the Kitchen, called Multi Step Peach, it's the perfect way to try Multi Step™ Stamping! This mini set also includes a Color Recipe inside the packaging - how cool is that! The other sets being released are: Giant Sunflower, Sunflowers, Owl & Autumn Moon and Pumpkins. I've created samples with each of these sets using various Techniques and Sketches along with my choice of Designer Paper - from Basic Grey, the two embossed cards also fit the Basic Grey Embossing Challenge. I used SCS Sketch 247 and the CuttleBug Highlights to create this card. To create the coloring on the pumpkins you'll be stamping and masking. 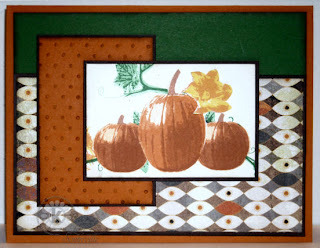 Stamp the center pumpkin as follows: #1 Tangelo stamp off, #2 Tangelo, #3 Potters Clay, #4 Potters Clay, #5 Potters Clay. Mask with Eclipse Tape, stamp smaller pumpkins using same colors. Mask, stamp vine as follows: #1 Cottage Ivy stamp off, #2 Cottage Ivy, #3 Cottage Ivy, #4 Cottage Ivy. Remove masks, stamp stems: #2 Potters Clay, #1 Dessert Sand. Stamp Blossom on scratch White: #1 Dandelion, #2 Tangelo, #3 Tangelo. Cut and pop up on a dimensional. This cute Sunflower and Watering Can is the set the KSS Georgia Attendees received last week and used with their Make & Takes. 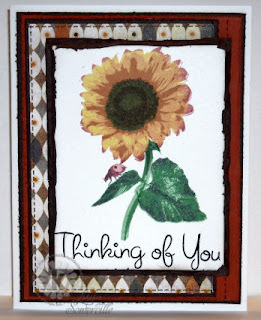 After assembling your Flip Flap Fold card, begin by stamping the smaller Sunflower (1B, 2B and 3B) as follows: #3B Potters Clay, #2B Rhubarb Stalk stamp off, #1 Dandelion. Mask - stamp leaves: #3 VersaFine Imperial Purple, #2 Cottage Ivy, #1 Cottage Ivy stamped off. Mask, stamp watering can: #1 Rhubarb Stalk stamp off, #1 Dandelion, #2 Rhubarb Stalk, #3 Potters Clay, #4 VersaFine Imperial Purple. Remove masks, stamp Cherish in Black. This card uses the Torn Frames technique around my Giant Sunflower and Drywall Stitching on the Basic Grey papers. For this particular Sunflower, I found it easier to stamp the flower first, then add my stem. Stamp as follows: Sunflower #3 Potters Clay, #2 Rhubarb Stalk, #1 Dandelion - ink edges with Rhubarb before stamping. Stem: #2 Cottage Ivy, #3 Imperial Purple, #1 Cottage Ivy stamped off. Leaves: #3 Imperial Purple, #2 Cottage Ivy, #1 Cottage Ivy stamped off. Ladybug: #3 Imperial Purple, #2 Rhubarb Stalk, #1 Rhubarb Stalk stamped off. This is the new Mini Set Multi Step Peach- those who attended the Georgia event last weekend received this as a gift! This card also uses MJ's TSSC88. Stamp your peach as follows: #3 Rhubarb Stalk stamped off, #2 Tangelo, #1 Dandelion stamped off, #1 Tangelo stamped off. Leaves: #3 Imperial Purple, #2 Cottage Ive, #1 Dandelion. #5 Potters Clay. The sentiment was stamped in Chocolate Chip. Thanks so much for stopping by, I hope you've been inspired by my Kitchen Sink Samples and use of patterned papers. If you're looking for more inspiration using patterned papers, be sure to click on the Bloggers Challenge Logo on my sidebar. Great cards! Love that DSP and those are some fabulous images! Holy cow! These are all fabulous. I am so in awe of the beautiful way these stamps work. Great layouts, great colors, great job! Very pretty! Those sets certainly are 3D looking! Lisa, what a beautiful collection of cards in these wonderful rich, fall colors. I was thrilled to get to meet you in Georgia. I loved your projects I found in my Stampin' Success! !You do such beautiful work! Great group of cards! Would make a fantastic gift. Great cards, Lisa! The pumpkins and peach are my favorite--amazing how "real" they look. Holy cow, Lisa!! You have been crazy busy! These are all soooo amazing! I can not wait to ink them all up...love how this set looks. Each so similar yet very different!! Can I just say wow! Those are beautiful! I love that sunflower! WOW!!! WOW! these are AWESOME!! I especially love those pumpkins! As always you totally ROCK! Great use of color Lisa! Awesome job! Have you slept since you got home, Lisa? What an amazing display of talent!! 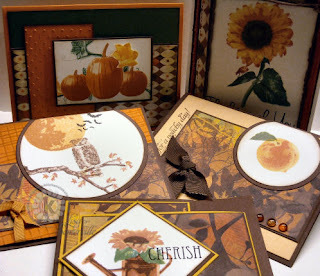 Your work with these gorgeous autumn sets is exquisite!! Rich colors, dazzling papers, fabulous layouts!! Awesome work, girlfriend! Wow!! Lisa, you've been busy!!! I can't get over how lifelike KSS stamps are. The pumpkins blow me away!!! Awesome cards!!!! ALL gorgeous! Impossible to pick a favorite! Can't wait for this release! 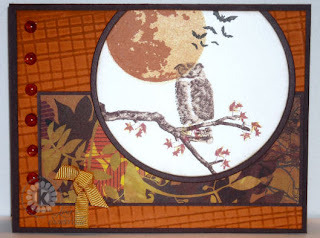 This set looks perfect with the Indian Summer paper & I'm totally drooling over the Owl & Autumn Moon. You know I'm going to ordering it. My stars girl you are on a roll with these cards. They are all fantastic! - Love all the wonderful fall colors. My favorite image (the owl in the tree). Outstanding cards. Boy have you been busy girl! Love each and every one. You are a great source of CASING!!! What a wonderful set of cards!!! Wow, Lisa, what beautiful cards! ou have been one busy stampin' lady!! Gorgeous papers and designs! What a beautiful set of cards, they are all fantastic. Oh Lisa! What a gorgeous set of cards!! Each design and images are just stunning!! Wow!! Lisa these are all FABULOUS!! You are a stampin' machine! It was SO good seeing you again, I really wish you lived closer:) I can't wait to get together again soon!! My word that is a swak of cards and so beautifully done..just fabulous...thanks for the BG link..I had lost it..
Oh my goodness!!!! Those are breath taking!!!!!!!! Amazing and perfect!!!! These stamps are sooooo cool! WOW! Great layouts and great use of the DP too! TFS! They are all so pretty!!! Love the different layouts and of course, those stamp images take my breath away!